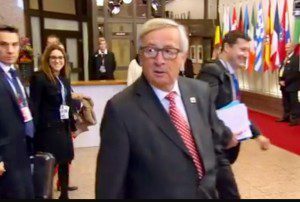 Jean Claude Junker responded to a question about his view of Theresa May with a simple dismissive raspberry style expostulation “Pfff”. Timing is all. The UK is not in a strong negotiating position. They are outnumbered 27-1 in the EU. They are not in a strong position at home because the Brexiters have a minority in Parliament and only secured a bare majority in the referendum of 37% of the population. Constituent parts of the UK voted to remain. In a report, the Institute for Government said unless all four leaders agree on the key elements of the UK’s negotiating position before the prime minister triggers article 50, formally starting the Brexit process, the result could be “a serious breakdown in relations between the four governments and nations of the UK”. As Tusk commented, the UK seems to want to have its cake and eat it when there is no cake. They want to have all the advantages of the EU without membership obligations. The mechanism for exit is also stacked against us. If the EU can’t negotiate a trade deal with Canada in 7 years how can we do so in 2? 2. Pound and Passporting – it’s the economy stupid! Whatever Brexiters may say, the removal of subsidies and exit from the single market is not a good thing for the UK economy. The pound’s fall demonstrates this. Leaving the single market would result in more tarrifs and less free trade with our largest trading partners. If the City loses its passporting rights we lose £10bn per annum. The NHS depends on freedom of movement. The Banks are leaving. There is no point going into a negotiation like a bull in a China shop, gloating arrogantly or demanding everything and giving nothing. This is the way the UK has behaved, as demonstrated by Mr Farage in the EU Parliament when he was rude about MEPs. There has been a complete failure to prepare both before and after the referendum. The UK party is divided and does not have clear instructions as to what it hopes to achieve. The foreign secretary changed sides during the referendum campaign for political advantage. The majority in the UK do not support exiting the EU. When Mrs May attended the EU summit she appeared wrongfooted and her speech was consigned to the 1am slot. Then she refused to negotiate in French. It is important to choose your negotiation team wisely. Unfortunately a bunch of political opportunists, jokers and a discredited minister have been appointed led by someone who apparently changed sides. Parliament wants to debate the proposals, so revealing the UK’s negotiating position. The public MPs and business want to know whether May wants hard or soft Brexit. Try as they might to keep their cards close to their chests and not give a running commentary, this is impossible. On the other side, the EU does not need to tell May what they are thinking. Whenever May tries to put forward a strong negotiating stance the pound tumbles and business heads for the door! The government is under attack in the Courts and Parliament wants a vote. This was just one of the many occasions where the three judges appeared to be less-than-convinced by the points they were making. It was a signal that the government really does have something to worry about. The losing side is likely to launch an appeal to the Supreme Court, a process which will inevitably force May to delay the timetable for invoking Article 50 no matter what happens. Ironically, if the Supreme Court is unable to reach a decision, it will be obliged to refer the case to the European Court of Justice. I think we can guess what they would say! May would be better of getting parliament’s approval so she knows where she stands and has the people’s support. All in all, there appears to be little prospect of negotiations succeeding or leaving the EU and we would be better off staying in the EU and negotiating from a position of strength.